Welcome to the home of R.L. 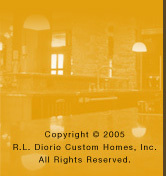 Diorio Custom Homes. The HBA of Dayton and the Miami Valley, in partnership with R.L. Diorio Custom Homes, will be sponsoring a million-dollar HBA Holiday House in 2006 to benefit The Children’s Medical Center of Dayton. Ron, Sandy and Jenny Diorio have generously pledged to contribute most of the net proceeds from the sale of the house to this very important organization in our community. Current plans call for construction of this very special house – to be built just off the intersection of Southern Boulevard and Blossom Heath in Kettering – to begin in late February. It is anticipated that the house, which will feature a holiday theme and will be fully furnished and decorated by one of our area’s leading interior design firms, will open to the public on November 24-26, December 1-3, December 8-10, and December 15-17.